Working together, land remediation specialists are embracing a consistent approach for cleaning up the UK's earliest nuclear sites. Embrace the latest techniques and regulatory guidance across all NDA sites. Develop information resource to share among all professionals involved in land remediation including site employees and contractors. Benefits Cross-estate consistency, deployment of most-up-date techniques and compliance with relevant policies and legislation. In addition to technology development, innovation also embraces new approaches or different processes that can bring a step-change in dealing with issues. One recent initiative has been the introduction of an information-sharing system for land remediation specialists who are involved in cleaning up the NDA’s 17 sites, which are located all across the UK. As decommissioning progresses over coming decades, all the nuclear licensed sites and the surrounding land will be comprehensively remediated to meet rigorous regulatory standards before being returned to their communities. Land quality specialists need to keep abreast of developments in best practice, legislation, policies, industry standards, regulator requirements and more. The issues are complex and numerous, ranging from asbestos-contaminated soil and buried structures to groundwater quality and disposal of low level radioactive waste. As part of the NDA’s strategy to encourage a ‘lead and learn’ culture, electronic news alerts and more detailed briefing notes have been introduced which are distributed on a regular basis to members of the Nuclear Industry Group for Land Quality (NIG-LQ), as well as the NDA-led Nuclear Waste and Decommissioning Research Forum’s Land Quality Working Group. Members include representatives from the NDA, Site Licence Companies (SLCs), contractors and the wider nuclear industry both in the UK and overseas. 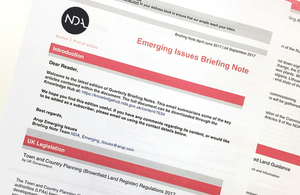 The Emerging Issues Briefing Notes signpost the latest developments in nuclear and non-nuclear contaminated land, and are issued in a comprehensive written format on a quarterly basis. Briefer news alerts cover issues that arise in the intervening time periods. Almost 100 subscribers have signed up for the tailored service. The information will be also available through a secure shared collaboration platform, The Hub, which is available through licence to all NDA and SLC employees, as well as suppliers, regulators and other interested parties. The NDA and the estate are also members of CL:AIRE (Contaminated Land: Applications in Real Environments), a not-for-profit organisation established in 1999 to stimulate the regeneration of contaminated land in the UK by raising awareness of, and confidence in, sustainable remediation technologies. Membership has help us by providing access to training courses at discounted rates and access to the CL:AIRE document library. Documents from the library have supported land quality project work on our sites.